San Pedro Colombia Village is located about twenty miles from Punta Gorda. It is a village whose residents still practice their traditional way of life, relying heavily on the forest for medicine and the river for water for drinking, washing and bathing. So when they began noticing heavy duty equipment moving into their forests unannounced, it troubled them. Troubling indeed. 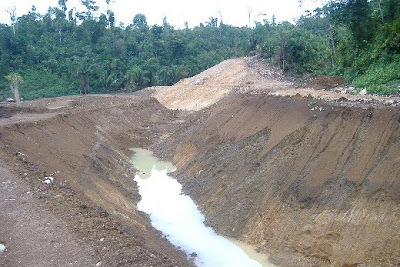 In short, the company behind Hydro Maya (Bradley Engineering), obtained permission to obtain research permits, then without obtaining the permits, without consulting or notifying nearby communities who actively use the river and surrounding forest to provide basic needs, and further, without contacting the Ya'axche Conservation Trust, who is the co-manager of the Bladen Reserve, began the dam project (you can view more pictures here). Ya'axche and community members of San Pedro Columbia have begun meeting in efforts to determine what action to take, and meanwhile, very little national press has covered the situation in Belize, and no international press has reported on the situation. Show your support for Ya'axche and the Maya people who depend on the forest, the river, and the surrounding environment. It irks me so much that these companies follow certain rules and restrictions when working within the states but once outside they just do whatever they want. Even more frustrating is the lack of media coverage. Not at all surprising though, unfortunately.